Part of our bike trip has required getting across the Caspian sea from Aktau to Baku. In order to accomplish this we first needed to obtain an Azerbaijan visa. In order to obtain an Azerbaijan visa a LOI is needed which is then taken to the Azerbaijan Embassy/Consulate that you chose when applying for the LOI. There are very few of these in this part of the world but fortunately for us a new consulate just opened in Aktau. As set visa dates are required for entering Azerbaijan having a consulate in Aktau means that you can choose your entry dates closer to the time of travel. I could not find any information online about where the consulate was and what is required so I have compiled our experience to help others following this path. 1. Go to the Azerbaijan Consulate (directions below). They were expecting us as they had our details which were sent to the consulate when we applied for our LOI’s. You will be given a receipt for the payment which you then take back to the embassy at which time the visa added to your passport. The whole process took us a couple of hours. We arrived just before 1pm and filled out our forms. Lunch was from 1-3pm, so at 3pm we handed in our bank receipt and within 20 minutes we had our visas. 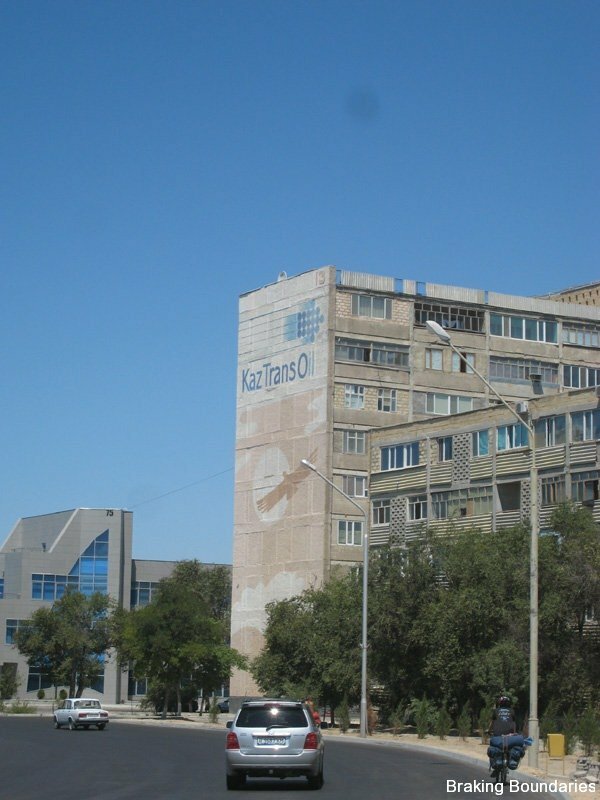 Firstly the consulate is in Aktau, not near the ferry terminal which is about 10km outside the city. 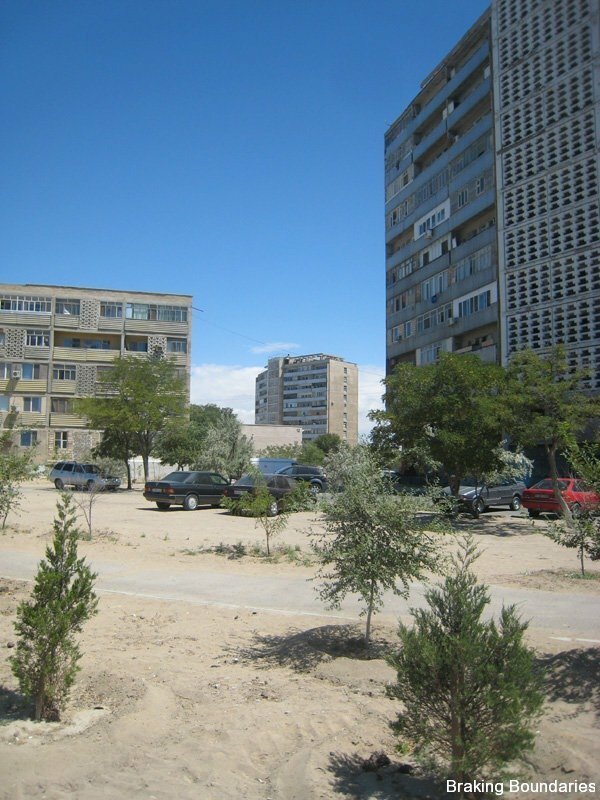 Aktau has a grid system for addresses. Areas are broken down into districts and then building numbers. Azerbaijan Consulate address: District 4, Building 12. 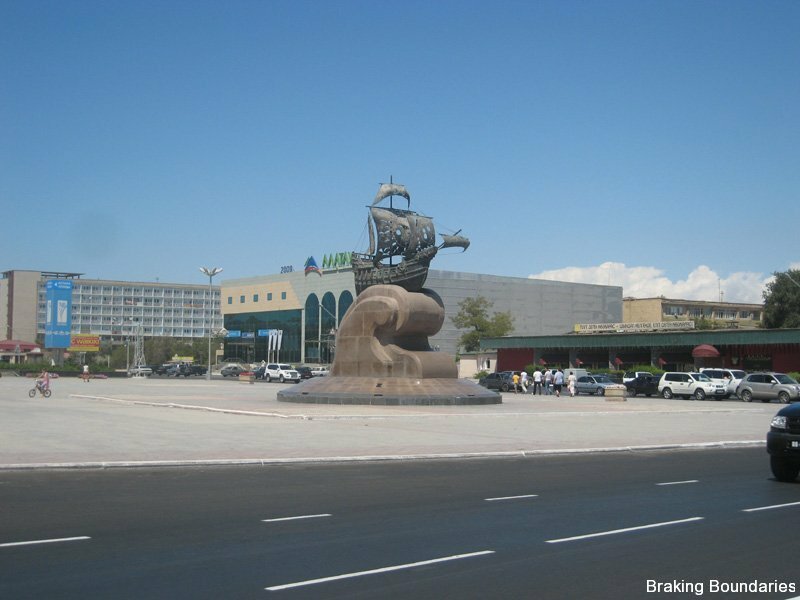 It is very easy to find when entering the city by heading up the coast with the Caspian Sea on your left hand side. This is the way you come from if you are arriving from the Train Station or the Ferry Terminal. You will go up a small ride to an intersection that has a statue of a ship. To the right is the main road of Aktau. 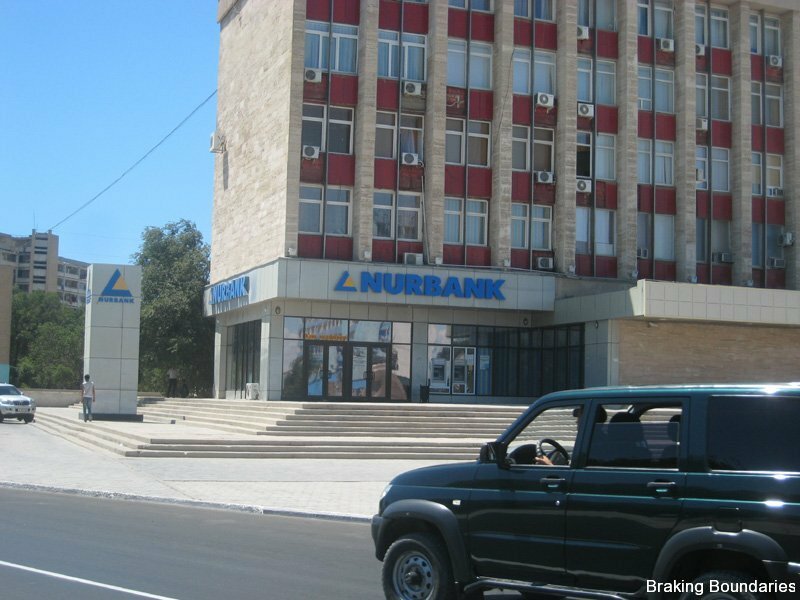 Stay left on the road that follows the coastline with a Nurbank on your right. NOTE: If you need photos turn right along the main road. About 100-200 meters on your left is a square. There is a photo center in this area. Picture of the Statue. The angle of this photo has been taken coming back from the coast road and has the main road on the left. Nurbank on the right as you follow the coast road. 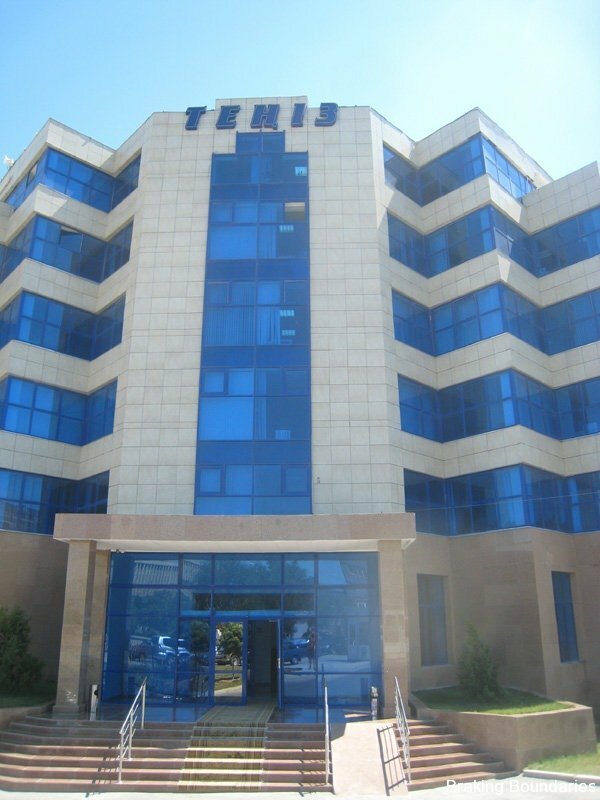 Shortly after the Nurbank you will pass a building with the sign TEHI3. On the first floor of the building is the AO Bank Center Credit. This is the bank you pay for the visa at once you have filled in your application form. In the bank are two western union payment booths and to the right of these is a door. Go through this door. Keep following the road as it goes past some very nice waterfront homes and bends round to the right. (about 500-1000 meters or so) As it bends around start looking at the old apartment buildings on the right-hand side When you see the building with the number 13 and the sign “KazTransOil” Stop! Look directly right before Building 13 and you should be able to see a small 2-story building with a 12 on it. 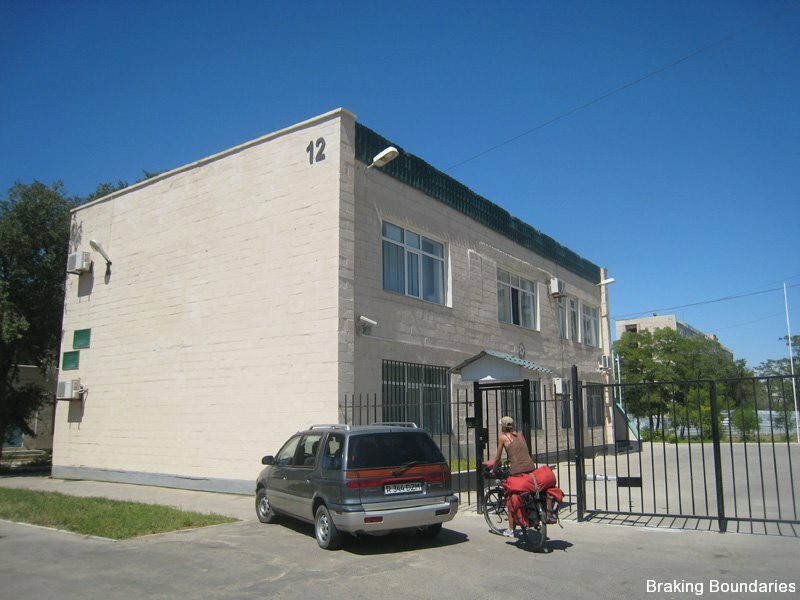 This is the Azerbaijan Consulate.